We were staying at the Lake Mead RV Village in the Lake Mead Recreation Area and did the Historic Railroad hike from the trailhead to the Hoover Dam with Jasper. The trailhead for the hike is located near the Lake Mead Visitors Center on the south side of the parking lot. Round trip mileage to and from the Hoover Dam is 7 miles. The gravel trail hugs the hills on the southern shoreline of Lake Mead and offers panoramic views of the Lake Mead. 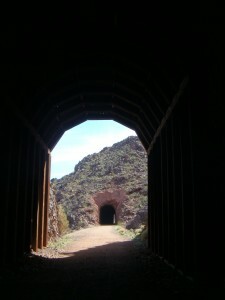 It snakes through five railroad tunnels on its way toward Hoover Dam. Trail history – After Hoover Dam was completed in 1935, the railroad ceased operation, and in 1962 the tracks were removed. In 1995 the trail was opened for recreation. A good description is included in Rails to Trails. The lake views are spectacular all along the trail. Peaks of ancient volcanic mounds rise above the lake surface of this drowned valley like the humps of an aquatic beast. Far in the distance, the craggy, smoky blue South Virgin Mountains rise into the clouds. “Pioneer trails” from early dam construction parallels the trail intermittently. Just before Tunnel 1, look down the ravine to the right to see concrete plugs taken from Hoover Dam to install turbines. In addition to the lake, the five tunnels are the trail’s featured attraction. Each is 25 feet in diameter to accommodate the large equipment that passed through its walls. You’ll come across the first and second tunnels in quick succession, and their dark interiors provide a cool respite from the desert sun. The Lake Mead National Recreation Area discourages hikers on any of its trails in the summer months, but fall and winter are prime touring seasons. As you pass through Tunnel 2, notice that the ceiling and sidewalls have been reinforced. This work was done after the tunnel was burned by arson in 1990. Wildfire gives rise to much of the plant life along the trail; creosote and mesquite bushes, which are fire resistant, are scattered in green and brown bundles along the trail and on the surrounding hillsides. In this unforgiving terrain, it’s quite a marvel to imagine the sheer magnitude of force needed to blast the path. In Tunnel 3 the arches were shored up to support the massive weight from above. Fault lines are visible in the rippled texture of the sienna hillsides all along the trail, and particularly in the rock face about 20 feet before Tunnel 4. Passing through Tunnel 5, burned in an arson fire in 1978 and only reopened in 2001, you come to the trail’s end at the nearly three-mile mark, with high rock walls on either side and a chainlink fence blocking further passage. Though the trail stops just short of the dam, the plan is to complete its final mile in the next year. For now, you can only to turn around and head back the way you came—along a pathway rich with engineering history and stunning lake and mountain views. The only downside that we experienced on this trail was the fact that no dogs other than service dogs are allowed on the “Cafe” deck at the Hoover Dam to which the stairs from the trail leads. Granted, we ignored the signs and everyone we met just loved Jasper…. probably because he was the only dog there. Honestly, I don’t enjoy going past the allowable limits, but I wasn’t about to leave my precious puppy up on the car deck to suffer in the 100 degree heat while we tripped down to see the Hoover Dam. Here is the collection of pictures that I took on our hike to the Hoover Dam on the Historic Railroad bed.